Who’s getting shut out of Peters Canyon? Families with kids, casual cruisers, recreational riders from other communities are effectively denied access today. While we hear a lot of fervent language about marauding mountain bikers– a subset of the larger mountain biking community– what’s lost on the Anti Crowd is the fact that the vast majority of bicyclists are neither marauders nor mountain bikers. 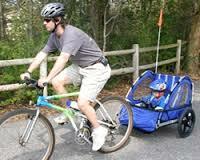 They are average OC citizens who use bicycles of all types for affordable recreation, health, and transportation. This lady look dangerous to you? She’s just looking for a quiet place to ride. The long awaited Class 1 trail through the Canyon is intended to link the Park with other communities, other parks, and other useful destinations. It will connect Santiago Canyon College with UCI for instance, Santiago Canyon Rd. to the Tustin Metrolink, Anaheim Hills to Newport’s Back Bay. 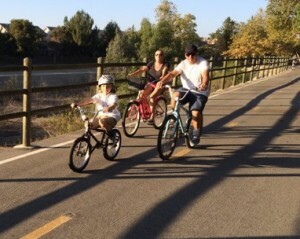 Kids, couples, retirees, friends out for a day’s adventure, all are attracted to a safe, engineered, well paved path away from car traffic and noise. He’s not into rutted dirt and the mud that comes after it rains. Not to mention the dust that gets thrown into Junior’s face off his back tire. Until the 1980s what bicyclists sought was a predictable solid surface to ride on. Then came mountain bikes, and guess what? They like to ride in the dirt. And we hear from mountain bikers in the Anti crowd who prefer to share Peters’ well worn trails with walkers, runners, and horseback riders. But how do the majority of Antis feel about that? Apparently not too good. The comments we read talk about an overcrowded park and the “danger” of “high speed” bicyclists– by which they mean mountain bikers– whizzing by on Peters’ busy trails. Why then, we wonder, would the Anti’s oppose a paved trail which would attract many, if not most of those very same mountain bikers? Because here’s something we’re convinced of: the majority of mountain bikers on the main trail today are just passin’ through. And if it means getting to the real trails, the single track, the hidden “toys,” the gnarly downhills some place else (say, Santiago Oaks) faster, a lot of them will hop on the pavement. This entry was posted in Cities, Tustin, Uncategorized by Pete van Nuys. Bookmark the permalink.